Very quiet meeting this month, only three members modelling. 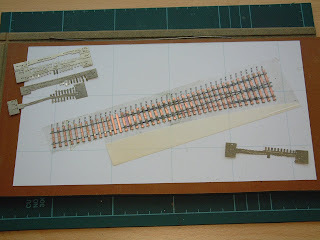 David (S) was working on the first piece of point work for his layout based on Goathland station on the North Yorkshire Moors Railway, see post below (28 Feb.'08). Using the Versaline Track system (available through the 2mm Scale Assoc. shop) of etched chairs, it is a curved point which was drawn up using TEMPLOT. We shall convene again on the 17 April, and if you would like to join us contact David (E) for further information.